Sing into your iPhone with the iRig Mic. IK Multimedia's new iRig Mic is the new sister product to the original iRig audio interface, and serves as a handheld condenser mic that can be plugged directly into your iPhone, iPod touch or iPad. The iRig Mic features a highly unidirectional condenser-electret capsule, with a three-level gain switch making it suitable for recording material at a range of different volumes. It connects to your iOS device's headphone output, with the dual mini-jack connector enabling you to plug in headphones at the same time so that they can be used for monitoring. The iRig Mic is complemented by three free IK apps. You'll know all about AmpliTube Free already, but there's also VocaLive, a suite of real-time vocal effects, and iRig Recorder, a simple audio recording tool. These can all be downloaded from the App Store, and of course, it's compatible with other apps that support mic recording too. 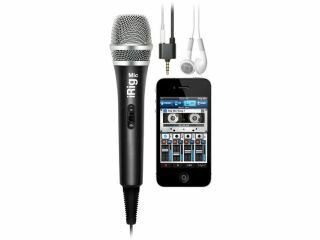 iRig Mic will be available in the first quarter of 2011 priced at €49.99 (+VAT). Pre-orders are currently being taken in IK's online store.